Toyota says the 'C-HR’s combination of facetted gemstone-like shapes with fluid surfaces and elegantly integrated detailing create a delicate balance of precision and sensuality'. It certainly is striking. Toyota is hoping that its new C-HR crossover will bring an incremental sales boost of around 100,000 units a year in Europe. The ambitious target equates to an 11% segment share and reflects the company's assessment that the tech-heavy car will straddle market segments and attract new buyers from premium brands as well as mainstream ones. Toyota is also aiming to lift its European hybrid mix through sales of the Turkey-built model which Toyota sees as a crossover with distinctive market appeal based on its 'coupe-like' styling and an emphasis on its hybrid offering. The C-HR will be available with just two powertrains in most markets - a hybrid set-up and a 1.2-litre gasoline engine. The styling of the vehicle was something that impressed many at the European media launch event in Madrid - the model faithfully follows concept previews in Paris (2014) and Frankfurt (2015). The name 'C-HR' stands for 'Coupe High-Rider' and Toyota maintains that the distinctive styling 'brings newfound dynamism and sensuality to the crossover market, combining a coupe-like upper body with the powerful underpinnings of an SUV'. The company also describes the model as an 'additional core model' rather than a niche model, in its European range. While the car will not be offered with a diesel engine, Toyota is aiming for high take-up of the hybrid variant and looking for 75% of sales to be accounted for by the hybrid. Indeed, Toyota's strategy in Europe is to raise the hybrid mix across its line-up so that at least 50% of its European sales will be accounted for by hybrids by 2020. 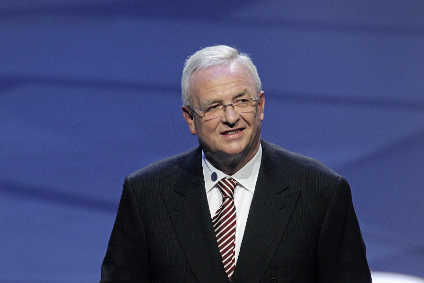 Fabio Capano, Toyota Motor Europe's communications director, told just-auto that Toyota is aiming to bring new conquest customers to the brand with the addition of the C-HR. "We believe the vast majority will be new to the brand," he said. "We could see the opportunity due to the rapid growth of the C-segment crossover segment, but we didn't want a 'me-too' product. So we have combined our latest hybrid powertrain with our latest platform, TNGA." The company describes the appeal of C-HR as being able to attract customers from the mainstream mid-size crossover segment (Renault Kadjar and Nissan Qashqai) as well as the premium segment sitting above that (models such as Mercedes GLA, Audi Q2 and BMW X1). "From the start of the concept, we had a very particular European customer in mind," said Capano. "This is a product for Europe and we see the customers as having very active lifestyles, they like to reward themselves, like nice things in life like art and design, but also very important, they are interested in new technologies. They know what is cool and they want to stand out. They like travel, new experiences and the car is important to them - an expression of their own personality. And they enjoy driving, which is very important. Their lifestyle is reflected in the way they drive. 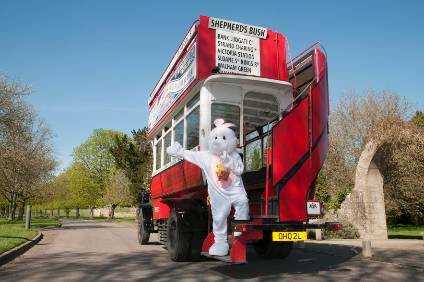 They drive in towns and they enjoy the challenge of driving in busy conditions." Toyota says the C-HR's development has been helped by putting it on a new flexible engineering architecture called TNGA (Toyota New Global Architecture) which gave its engineers and designers the freedom to deliver a 'new and fresh take on the increasingly commoditised crossover segment'. As in many other parts of the global vehicle market, crossovers - and especially compact crossovers - have been booming in Europe. The new C-HR is the second model to be built on the Toyota New Global Architecture (TNGA) GA-C platform after the fourth generation Prius. A key benefit of the TNGA C-platform is a low centre of gravity and, for the C-HR it is claimed that this key quality is lower than for any of its competitors. Components can also be placed lower in the engine bay than in previous generation models. The GA-C platform in the C-HR enabled the engine to be angled slightly rearward, helping the designers secure a lower bonnet line as well as contributing to the lower centre of gravity. 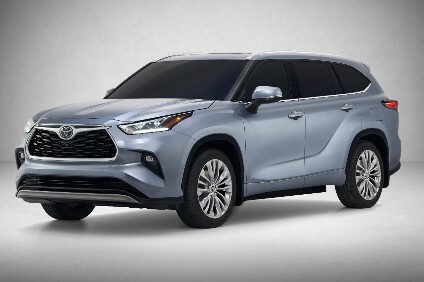 Direct benefits, Toyota maintains, are gained in balanced handling, a more engaging drive and much less body roll than is often experienced with tall crossover models. A key differentiator in the segment for C-HR is the hybrid technology. Toyota says the latest-generation hybrid power plant in the C-HR generates CO2 emissions as low as 82 g/km – a figure claimed to be unrivalled within its segment – and returns combined fuel consumption of only 3.6 l/100 km. Toyota says the new hybrid powertrain is more efficient and lighter than the previous system, while also offering sharper performance. Detailed design changes to the engine have resulted in a thermal efficiency of 40% – a 'world-beating performance for a petrol unit' it is claimed. The new hybrid battery offers higher energy density. Whilst its total power was maintained, its size could be reduced by 10%. The Toyota C-HR's hybrid system features a 1.8-litre VVT-i Atkinson cycle petrol engine. 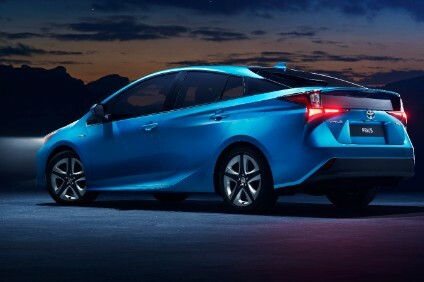 Compared to the third generation Prius, the unit has been 'completely re-engineered to deliver significantly better fuel economy'. Other hybrid system components have been made lighter and smaller, and have been repositioned for optimum packaging, further contributing to the car's low centre of gravity. Updates to the hybrid system software allow the Toyota C-HR to draw more on its electric drivetrain, allowing it to accelerate in a low engine rev range, Toyota says. 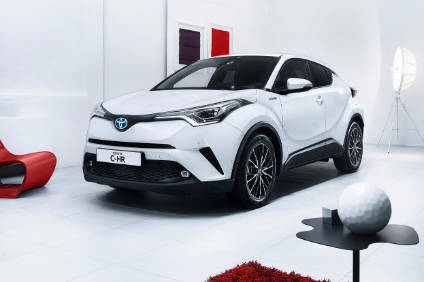 The Toyota C-HR is also available with a new 1.2-litre turbo engine, which debuted in the Auris. The unit generates CO2 emissions from 125 g/km and returns combined fuel consumption from 5.5 l/100 km. It may be mated to either a 6-speed manual gearbox or a Continuously Variable Transmission. CVT equipped versions are available with either front- or all-wheel drive. The consensus among many journalists testing the cars was that the 1.2-litre is the 'fun' variant for the enthusiastic driver. It will certainly be interesting to see how the hybrid mix works out in practice. A low-volume 2-litre CVT-only model will be available for certain markets (Ukraine and Caucasus). The C-HR is available with a large range of ADAS systems under the 'Toyota Safety Sense' umbrella. These include a pre-collision system that includes an audible warning, brake assist and automatic emergency braking. There is also adaptive cruise control, lane departure alert, automatic high beam (which uses the the same windscreen-mounted camera as the lane departure alert). The car also comes with road sign assist and is available with additional ADAS features including a blind spot monitor and rear cross traffic alert. Rear cross traffic alert uses the same radar sensors - mounted on the rear corners of the vehicle as blind spot monitor - to monitor traffic approaching traffic from either side as the vehicle is reversed out of a parking space. The Toyota C-HR offers Toyota's new Simple Intelligent Parking Assist (S-IPA) system, which uses an array of sensors to identify viable parking spaces and surrounding objects. Improvements to the technology allow it to work in parking spaces up to 22% smaller than previously, the company maintains.